This is going to be a big show to unpack as there’s a lot of people in this, so here’s a quick summary of my feelings on these shows. I love them! All except Iron Fist, which I hate, and anyone who follows me on social media has heard about why. 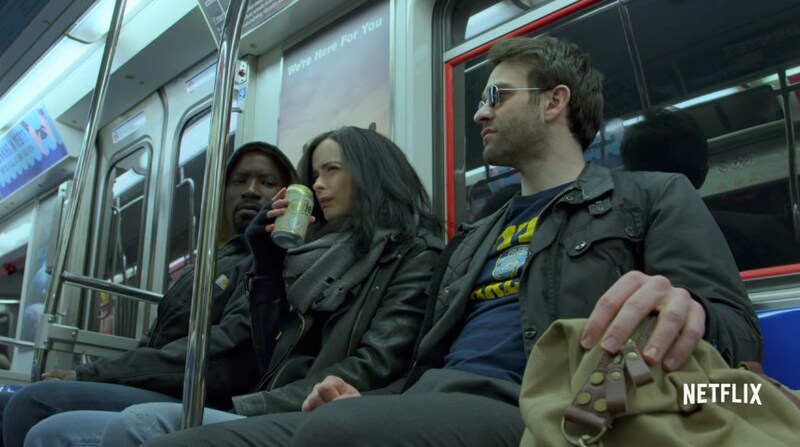 But I loved Daredevil, Jessica Jones, and Luke Cage (albeit that last half of his season was a slog at times). As characters I deeply love them and I’m invested in them. I like their supporting characters. When asked what needed to be watched before seeing this show, my vague answer was probably Daredevil season 1 and 2, and possibly Iron Fist if you could stomach it. I was right about that, since outside of some character introductions missed, there wasn’t a lot that carried over from Jessica Jones and Luke Cage. At the end of the day though, the answer is none. This show should have been able to stand on its own, because they are creating a series for a wide audience that might not have been able to see everything. I think they did that … reasonably well. It doesn’t mean the show is good. But it could have been a lot more confusing to newcomers. 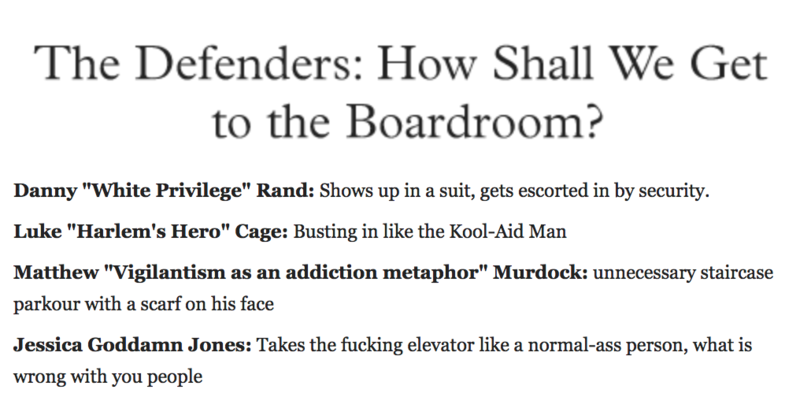 So here’s the gist: Matt Murdock fought with the Hand a lot. We’ve had it built up that the Hand are the bad guys for a long time, sustained by Iron Fist’s main plot being all about them. We know they’re a huge criminal organization of ninjas. We know their leaders have huge power and influence over many parts of businesses and organizations. Matt’s love Elektra was killed by them, after refusing to exist as the Black Sky, some prophetic baddie the Hand wanted her to be. Jessica Jones defeated the man who mind controlled and raped her, but surprise surprise, trauma isn’t something you can just shrug off. Kudos to them for not making it all instantly better. She’s still not sure if she wants to care enough to take on detective cases. Luke Cage was sent to jail because he broke out of it before the end of his time. Danny Rand found out that his negligence of K’un L’un led to its complete destruction, and while he feels really guilty about it now, this could all have been avoided if he didn’t abandon his sacred oath for funsies. Matt retired from vigilantism but still feels the pull toward it and violence. Matt is a blind ninja with enhanced super senses, and a lawyer by day, he’s the only one who cares about a secret identity. Jessica has super strength, endurance, and she’s pretty tough. Luke has impenetrable skin and bullets flick off him. Danny can focus all of his chi into his fist and it can send shock waves to anyone hit by it or in the vicinity. There you go. Those are the Defenders. The only people directly in the story to start with are Danny and his girlfriend/former Hand member Colleen Wing. They have been trying to track down the Hand and have a run in with Elektra, who is hidden for now but everyone knew she was back. Jessica gets sucked into the story by a woman looking for her missing architect husband, and she gets a call warning her to back away, but of course she ignores that. It’s the surefire way of getting her attention. Luke finds out that young men in Harlem are being used by the Hand and then killed, presumably once they’ve been caught but are no longer helpful. There’s a huge earthquake that sets Matt in motion to start up again, and he is called by Foggy to help out Jessica when she’s arrested. That draws him in too, but he obviously has a history with the Hand. It takes FOUR EPISODES for the main cast to actually get together. They have one big fight at the end of episode three where we see them in action, and it’s a great scene. Before that Luke and Danny get into a fight, which is hilarious as Luke just bitchslaps him around like a fly. So anyway, Sigourney Weaver is the bad guy, ish. There’s a few bad guys, but she’s set up as the first. She’s the leader of the “Five Fingers of the Hand” and she’s dying, although I wonder why and how and if she has any powers? I can’t tell. I think they’re all supposed to, but nothing comes to mind. She’s very old, hundreds of years at least. She is the one who resurrected Elektra as her Black Sky, using the last of their resurrection juice to do it, as she believes some prophecy that Elektra will help them win the day. I think. The whole plan is that the Hand leaders are no longer immortal without this special substance they could only get with the help of the Iron Fist. They blew open this huge whole underneath their building, this was seen in DD season 2, in order to get to the place where Iron Fist can open a wall. I guess this will lead to the destruction of New York? Somehow? I’m sure there’s a reason but it doesn’t make any sense to me, or it wasn’t very clear. Maybe it just means as they can never die they will keep making trouble. The group decides to blow up the building and that saves the day maybe? I mean yes if they kill the leaders that’s good, but there’s still a lot of Hand members and lieutenants out there, people. Matt “dies” because he’s trying to save Elektra, who killed Sigourney Weaver and took over. But he’s not dead because we know Daredevil season 3 is coming. Sigh. There’s a lot in between I’m glossing over. I will say this, when the four of them are together or interacting, it is pretty damn fun. I loved the team up of Matt and Jess trying to figure out what the architect’s plans were for blowing up the place. I genuinely liked the building friendship between Danny and Luke, even if Danny is useless and ruins everything by letting Elektra trick him into opening the wall. For crying out loud, you damn fool, she played you. Ahem. I liked their dinner in the Chinese restaurant. I liked their conversations. I would love to see them all interact with a better storyline. The Hand is overdone at this point, it’s a pretty dull storyline and it wasn’t satisfying. There was no real indication of if these people had powers and what the Defenders were … defending? New York City. I got that. But blowing up a building was a weird way to do that. I’d love to have seen them fight a NEW threat and a NEW villain as a team. I’m tired of the Hand. Shout out though to Sigourney Weaver who is still a glorious wonderful actress I will always adore. Other highlights are the supporting cast. While a lot of the time it felt like they just pointlessly had the side characters do things, it was still neat to see them talk to each other. Karen Page talking to Trish Walker was great. It made me smile. Colleen Wing and Misty Knight becoming friends was beautiful. They had some very powerful and brilliant women in this show, let’s not forget the queen of them Claire Temple, and I was so here for that. Everyone had their own stories and their own little arcs, and I appreciated that. I feel like the personal parts, the back and forth with characters, was all well done. The fight choreography was only impressive in the board room. The music was really weird at times. The lighting was cool in theory but eventually became distracting for me. Each person had their own color so their lighting was about that, it was a great concept, but not forever. I’m not sure who thought those camera angles were brilliant, but they were also very distracting. ALL OF THOSE WOMEN ARE AMAZING. So it’s a mixed bag, honestly. The general plot, bad guys, and a lot of the visual aspects were not very impressive. The character arcs, acting, and dialogue were solidly done and I enjoyed those parts a great deal. The main four needed to get together sooner. Once they teamed up, the show got much better, but it took half of the season to get there. That’s not what you do when you only have EIGHT EPISODES. I just didn’t feel like in the end there were big stakes. I didn’t believe New York City was going to be destroyed if they didn’t blow up that building. I thought Matt’s “dying for New York” is laughable because he died for Elektra, not for New York. Their plan to save the city would’ve been fine if he went with the others and let her die down there. So no, he died for her, not for his city, c’mon now. And when you announce a new show you take all the power off of a sacrifice regardless. Sigh. I’m all over the place with this show. I think they could have done better. They had a GREAT cast. They had great characters to work with. They had time to think through what they wanted to do. They have access to money and great fight choreographers. There’s no real excuse why the show at any point ended up a dull mess. All the pieces were there. There were genuine moments of brilliance and places I smiled a lot and could see this being a better show. In the end, it was too scattered and fell into the “meh” category. ALAS. I’m not at all interested in the Punisher, so I’m waiting for Jessica Jones season 2 at this point. And secretly hoping we have a Misty and Colleen show (Claire can come too). Misty now has the metal arm, errr I mean she will, since she lost her arm. Please do this for me thanks. Honestly I couldn’t get into everything here. I might write something specifically about certain characters or plots that I do think worked, but for now, this was the best I could do when presented with the show. Posted in TV Show, TVReview and tagged with charlie cox, danny rand, daredevil, deborah ann woll, finn jones, foggy nelson, iron fist, jessica henwick, jessica jones, krysten ritter, luke cage, marvel, marvel netflix, matt murdock, mike colter, rachael taylor, rosario dawson, simone missick, superheroes, the defenders, trish walker.